RIO DE JANEIRO, Mar 16 2012 (IPS) - A year after workers’ riots that brought work on the Jirau hydroelectric dam to a halt for months and forced the government and companies to engage in national negotiations to improve labour conditions in the construction industry, another strike has caused tension again in the dam construction project in northwest Brazil. The strike, which 1,500 workers of Enesa Engenharia, the company installing the generating units on the project, began on Mar. 8, grew this week to include all of the workers on the Jirau hydropower plant – around 20,000. The workers went on strike because Enesa did not sign a new national labour agreement. The “national commitment to improve working conditions in the construction industry” has been in effect since Mar. 1. It includes measures designed to ward off strikes and labour conflicts on construction sites, and was signed by the government, nine large construction companies and six central trade unions. The tripartite agreement established permanent representation for workers in on-site negotiations with the administrators of construction projects, and the creation of health and safety commissions. It also stipulated that workers must be hired through official channels, thus eliminating the abusive “gatos” or cats, the name given to those who recruit labour for unscrupulous employers. But Enesa did not sign the agreement and has not responded to the grievances of its employees in Jirau, such as demands for better workers’ dormitories and common areas, said Cláudio Gomes, president of the construction workers’ union, CONTICOM. “There are eight people in each lodging unit, and no privacy,” said Gomes, while the Enesa workers’ neighbours, who work for the Camargo Corrêa construction company, have better conditions. Gomes travelled from the southern city of São Paulo to support the local union in the negotiations. Describing demands that will be negotiated in May, the trade union leader said the striking workers are also seeking better wages and other benefits. On Friday morning, a workers’ assembly decided to continue the strike, although the labour courts declared it illegal on Thursday, in a ruling that orders the local union to pay a fine of 111,000 dollars for each additional day the workers are on strike. Tension is running high again at the Jirau construction site, Gomes said. But the peaceful nature of the strike stands in contrast to the violence that broke out at the same site on Mar. 15, 2011, when furious workers set fire to 60 buses and other vehicles and most of the lodgings, built to house 16,000 workers. The chaos spread, aggravated by the equally violent police crackdown, and thousands of workers fled to Porto Velho, the nearest city, 130 km away, where they were given shelter, mainly in a stadium. The uprising also led to the interruption of work at the Santo Antônio hydroelectric dam being built on the Madeira river, just seven kilometres from Porto Velho, the capital of the northwest Amazon jungle state of Rondônia. Overnight, more than 40,000 workers were left without employment and many returned to their homes in distant states. Construction on the Jirau dam gradually resumed only three months later, and completion of the hydropower plant was postponed to nine months after the initial target date, originally set for this month. The 2011 crisis prompted the federal government to push for negotiations between the construction companies and trade unions, to avoid further conflicts and ensure that priority infrastructure works and the construction projects for the FIFA World Cup, to be held in 12 Brazilian cities in 2014, would be completed on time. For the last five years, trade unions have been trying to negotiate a collective national agreement for the construction industry, to overcome the precarious nature of employment in this strategic sector, but without getting a response from the companies, said Luiz Carlos Queiroz, secretary general of CONTICOM. The unrest in Jirau a year ago triggered a wave of strikes at other major construction sites, and finally brought about the dialogue that led to the achievement of the tripartite national agreement, he said. “We accepted the agreement that was within our reach; we did not get everything we wanted,” but it was a step forward, and can be improved through mobilisation and monitoring, he said. At first only nine large companies signed the agreement, including two involved in construction of the Jirau and Santo Antônio plants. Other companies have the option to join voluntarily. There are 170 construction companies in the country, according to the Brazilian Chamber for the Construction Industry (CBIC). Trade unions view the agreement as “timid,” but it sets in motion a process that allows longstanding problems to be solved for a sector of workers who have historically been “marginalised” and have now gained “spectacular power” because Brazil’s construction frenzy has created a shortage of labour, Gomes said. A decade ago, over 60 percent of the workforce of construction firms were informal labourers, and now the proportion is “no more than 30 percent,” Gomes said. Counting “all those economically active,” including independent workers, the reduction in the number of informal workers is equally great, but the proportion in the informal sector is still around “40 to 45 percent,” he said. The struggle for decent work in the construction industry, overcoming the traditional precariousness and low wages, is hampered by the high turnover, low-skilled jobs and frequent migration, which do not favour the organisation of workers, said Queiroz, the son of a migrant from Brazil’s poor northeast region. Many people accept piecework, and then work extremely long hours in order to increase their earnings, risking illness or accident and the curtailment of their future employment prospects, he complained. But conditions for construction workers are changing. In São Paulo, basic wage scales for workers in the industry are higher than for metalworkers, a conquest achieved through “strikes and struggles” that also won them the right to breakfast and an afternoon snack, Queiroz said. In his view, the Jirau riots were “a starting point” for more promising times. The concentration of large number of workers at the sites of big infrastructure building projects favours the organisation and growth of trade unions, he said. 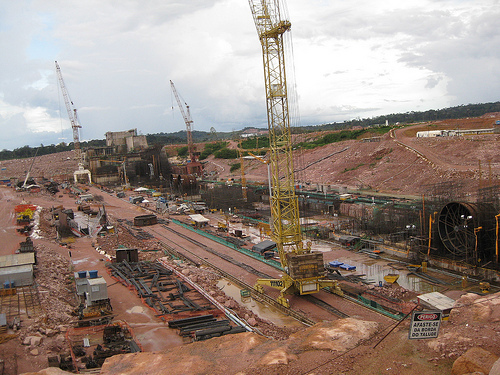 The Rondônia construction workers’ union, STICCERO, for example, became stronger as a result of the huge increase in its membership after work commenced on the Santo Antônio and Jirau hydropower projects in 2008.